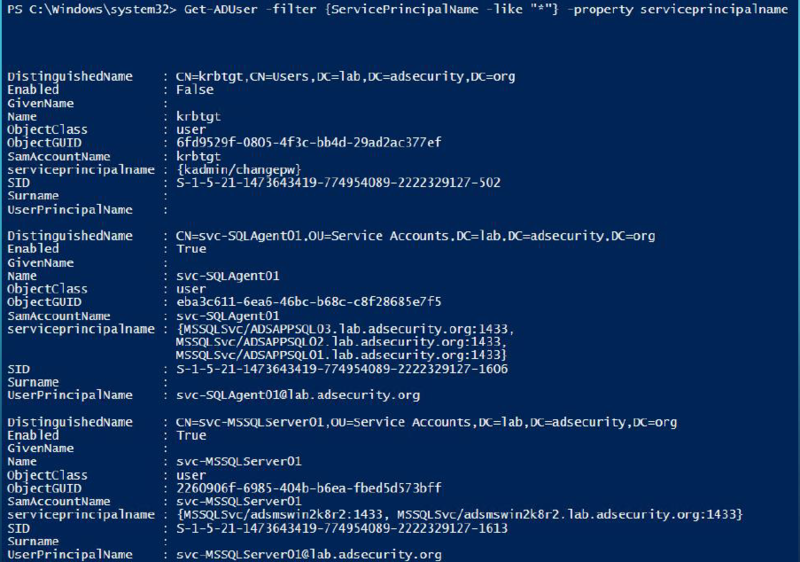 There are many ways an attacker can gain Domain Admin rights in Active Directory. This post is meant to describe some of the more popular ones in current use. The techniques described here “assume breach” where an attacker already has a foothold on an internal system and has gained domain user credentials (aka post-exploitation). The unfortunate reality for most enterprises, is that it often does not take long from an attacker to go from domain user to domain admin. The question on defenders’ minds is “how does this happen?”. The attack frequently starts with a spear-phishing email to one or more users enabling the attacker to get their code running on a computer inside the target network. Once the attacker has their code running inside the enterprise, the first step is performing reconnaissance to discover useful resources to escalate permissions, persist, and of course, plunder information (often the “crown jewels” of an organization). We start with the attacker having a foothold inside the enterprise, since this is often not difficult in modern networks. Furthermore, it is also typically not difficult for the attacker to escalate from having user rights on the workstation to having local administrator rights. This escalation can occur by either exploiting an unpatched privilege escalation vulnerability on the system or more frequently, finding local admin passwords in SYSVOL, such as Group Policy Preferences. I spoke about most of these techniques when at several security conferences in 2015 (BSides, Shakacon, Black Hat, DEF CON, & DerbyCon). 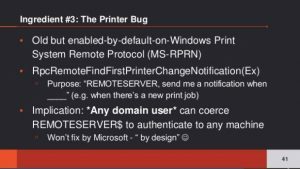 I also covered some of these issues in the post “The Most Common Active Directory Security Issues and What You Can Do to Fix Them“. The past couple of years of meeting with customers is enlightening since every environment, though unique, often has the same issues. These issues often boil down to legacy management of the enterprise Microsoft platform going back a decade or more. 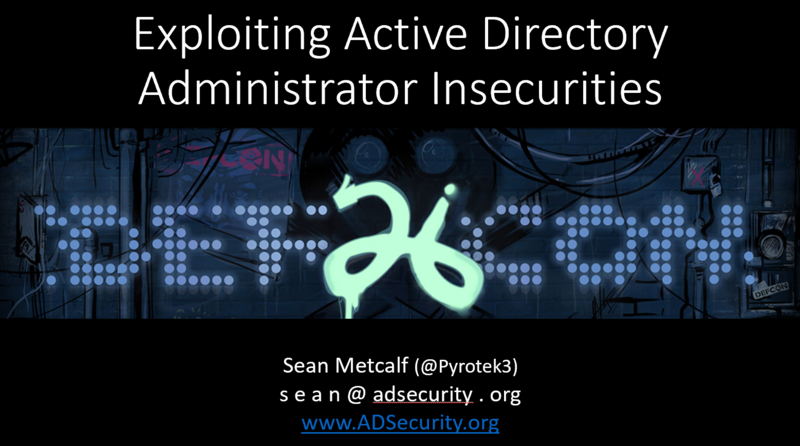 I spoke about Active Directory attack and defense at several security conferences this year including BSides, Shakacon, Black Hat, DEF CON, and DerbyCon. 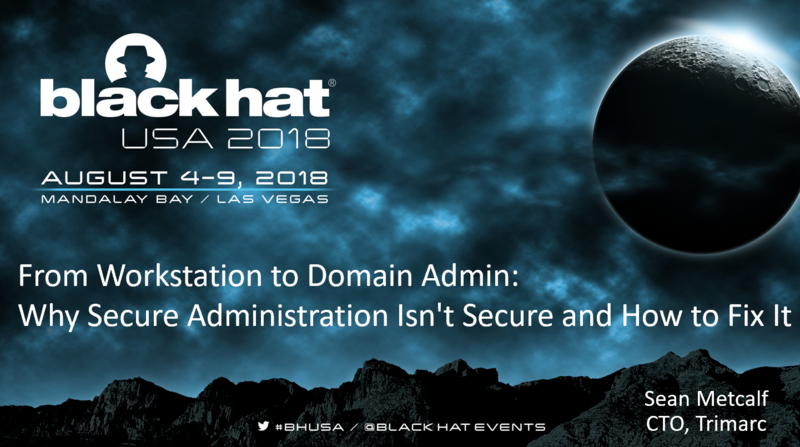 These talks include information about how to best protect the Active Directory enterprise from the latest, and most successful, attack vectors. Assume breach means that we must assume that an attacker has control of a computer on the internal network and can access the same resources the users who have recently logged on to that computer has access to. Note that when I describe risks and mitigations of Active Directory,this includes overall enterprise configuration. Here are some of the biggest AD security issues (as I see them). This list is not complete, but reflects common enterprise issues. I continue to find many of these issues when I perform Active Directory Security Assessments for organizations. Service accounts are that gray area between regular user accounts and admin accounts that are often highly privileged. They are almost always over-privileged due to documented vendor requirements or because of operational challenges (“just make it work”). We can discover service accounts by looking for user accounts with Kerberos Service Principal Names (SPNs) which I call SPN Scanning. Service accounts without SPNs can also be discovered by querying AD accounts for ‘SVC’, or ‘Service’, or common vendor product names. 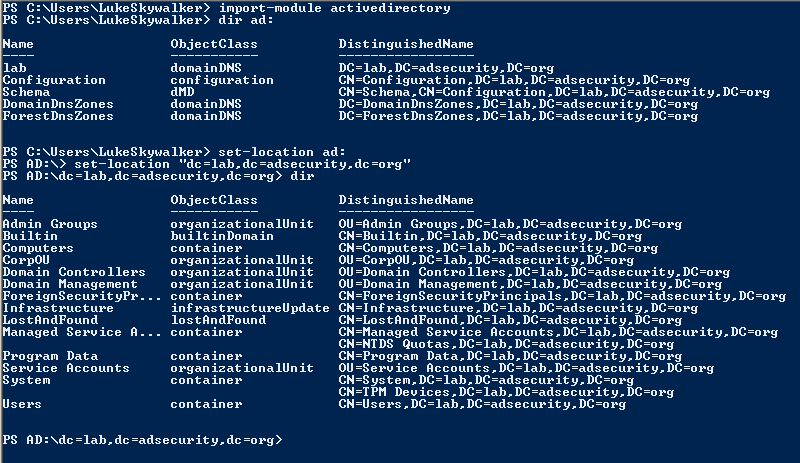 The following PowerShell commands require the Active Directory PowerShell module. While Domain Admins is the most commonly used AD admin group, there are several others that could be used. Full administrative rights to the AD domain and Domain Controllers. Full administrative rights to computers joined to the domain (default) and full administrative rights to the AD domain and DCs (through membership in the Administrators group). Default rights to backup and restore Active Directory and Domain Controllers. Able to logon to Domain Controllers and provides ability to perform some administrative actions on Domain Controllers. Full administrative rights to all domains and Domain Controllers in the AD forest (through membership in the Administrators group). Also has special forest admin rights such as DHCP. In a single domain forest, this group should remain empty until needed. Able to modify the AD schema for the forest. This group should remain empty until needed. I have been fascinated with Read-Only Domain Controllers (RODCs) since RODC was released as a new DC promotion option with Windows Server 2008. Microsoft customers wanted a DC that wasn’t really a DC. – something that could be deployed in a location that’s not physically secure and still be able to authenticate users. This post covers a few different scenarios on how to attack Read-Only Domain Controllers in order to escalate privilege. Since RODCs are typically untrusted and viewed as not having the same level of access as writable DCs, it’s possible in many environments to compromise a RODC to escalate privileges. Given certain scenarios, it’s possible to escalate from a Read-Only Domain Controller to a full writable Domain Controller. This post covers these scenarios and enables Red and Blue teams to better understand and check RODC configurations for issues. The information in this post is not from any one customer environment I have seen, but a combination of several. I have found that many AD domains that have RODCs are configured very similarly: many more accounts, both user and computer, have passwords cached on RODCs than is necessary and the ability to manage RODCs is not limited or secured appropriately. This post shows what is possible given common real world RODC deployment configuration. As part of our Active Directory security review services, we scrutinize RODC configuration and identify potential issues with the configuration. Furthermore, we find that when RODCs are deployed in an environment, they are frequently configured with weak security settings (as noted in “RODCs in the Real World” and “Attacking RODCs” below). The information here describes what is possible in many Active Directory environments with Read-Only Domain Controllers and doesn’t highlight a misconfiguration, but common configuration issues that could be exploited to escalate privileges in the domain since the RODC is often treated as “just another server” (or worse, as a workstation). Accounts are regularly cached on RODCs (since RODCs that don’t cache passwords aren’t very useful) and once an attacker gains access to it, these passwords are available and may include delegated Active Directory admin accounts which could be compromised. If you want to simply know how best to “harden Read-Only Domain Controllers”, skip to the end to read the “Securing RODCs Against Attack” section. 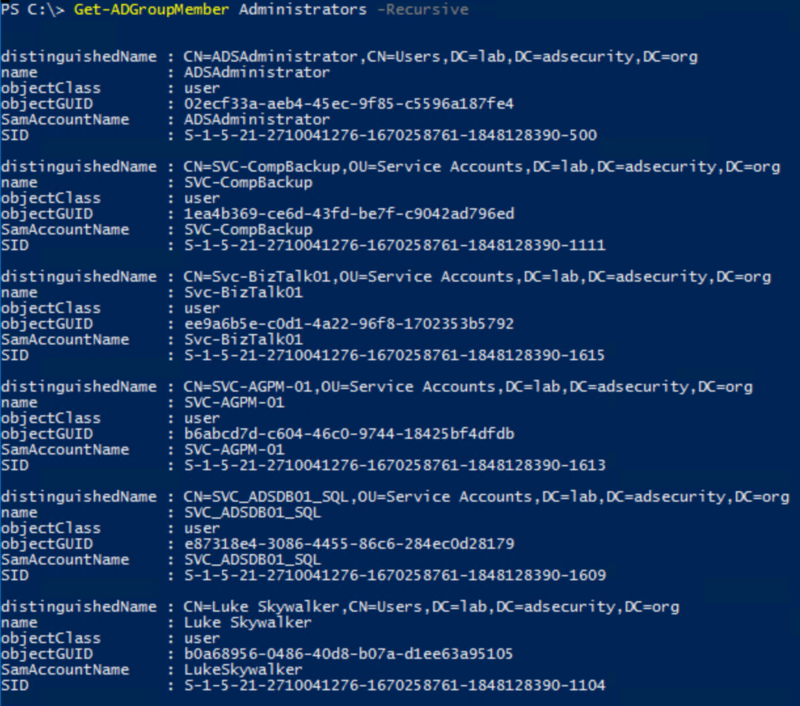 Note that throughout this post, I use the Microsoft Active Directory PowerShell cmdlets and some of the attribute names are adjusted in the output from what they are actually named in AD. When Microsoft released Windows Server 2008, a new type of Domain Controller was added called the “Read-Only Domain Controller”. The Read-Only Domain Controller (RODC) performs similar services as a writable Domain Controller except they are “read-only”. But what does that really mean? Many organizations are moving to the cloud and this often requires some level of federation. Federation, put simply, extends authentication from one system (or organization) to another. Gerald Steere (@Darkpawh) and I spoke about cloud security at DEF CON in July 2017. One of the key items we covered was protecting Federation Servers, specifically Microsoft Active Directory Federation Servers (ADFS). Microsoft is currently updating guidance for securing ADFS. This post describes key ADFS concepts and a short-list of security recommendations on how to properly protect ADFS. The federation server typically lives on the internal network with a proxy server in the DMZ. There are certificates installed on the Federation server. Claim rules: determine what type of access and from where access is allowed. Federation server (or proxy) is on public internet via port 443 (HTTPS). Microsoft provided several Active Directory PowerShell cmdlets with Windows Server 2008 R2 (and newer) which greatly simplify tasks which previously required putting together lengthy lines of code involving ADSI. On a Windows client, install the Remote Sever Administration Tools (RSAT) and ensure the Active Directory PowerShell module is installed. Note that with PowerShell version 3 and newer, you don’t need to run the first line since Powershell will identify the necessary module and auto load it.